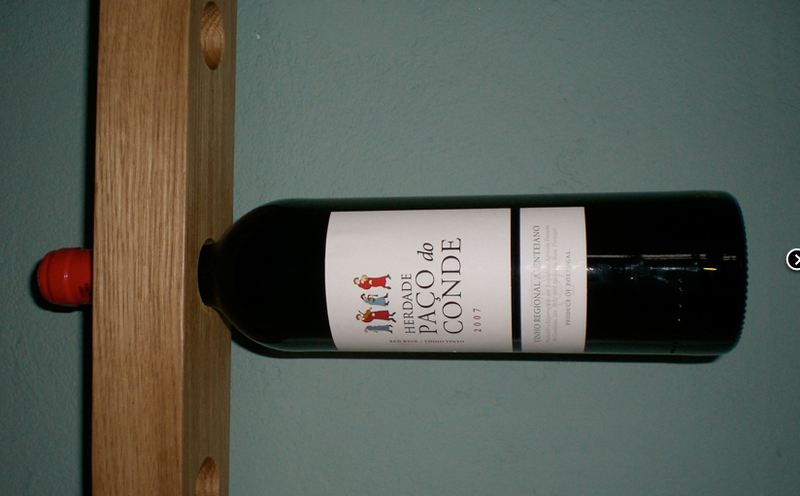 Someone was teasing me lately about the expensive products that I sometimes include in this blog. So it seems a good time to mention the least expensive of all options: using things you already own. I recently de-cluttered and reorganized my home office and I'm very excited about it. I wanted to share with you some of my recycled shoe boxes I used for storing loose items. I used pretty gift wrap to cover the boxes, then labeled them with adhesive business card sleeves--that way I can remove the card from the sleeve and insert a different one if I choose to change the contents of the box. The worst room in your house to stockpile your medicines is the bathroom. 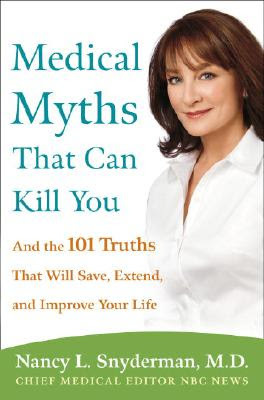 The humidity and swings in temperature can age medications prematurely, which is why I keep the real medicines - the ones we take by mouth - in a separate area in a hall closet. 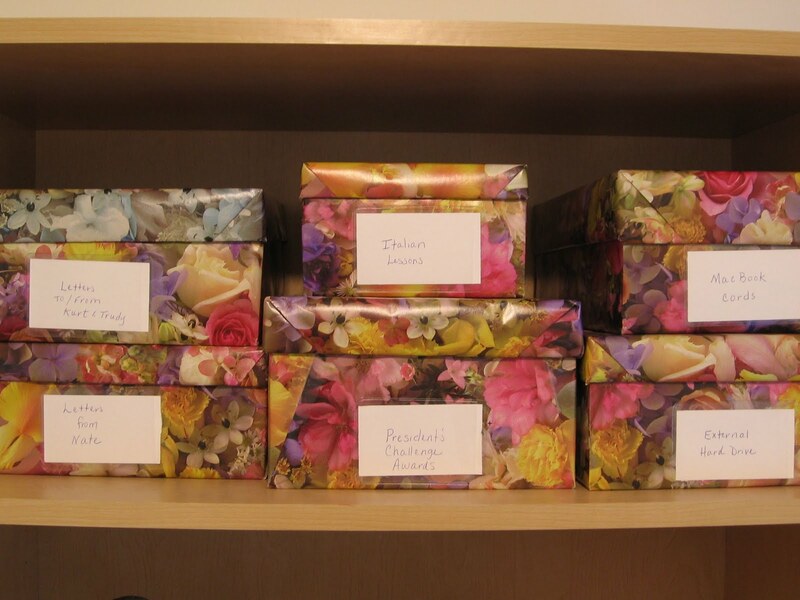 If you don't have that kind of storage space, just grab one of your old shoe boxes and arrange the essentials neatly inside. But remember: if you have children or grandchildren around your home, you must keep this box out of their reach. 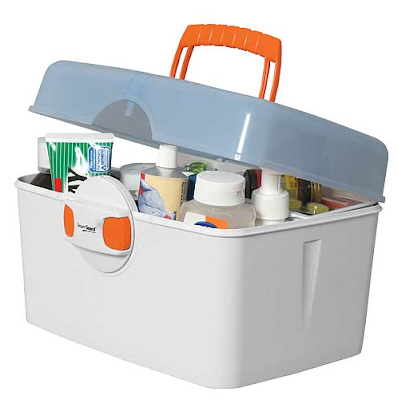 Use your built-in medicine cabinet for things like bandages and dental floss. 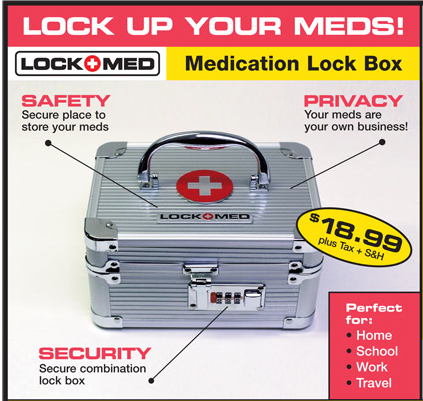 If you'd like to heed Snyderman's advice, you might want to consider a lockable case. Or you could get a locking medication box from Lockmed. The best answer on how to store the magazines is often "don't store them." But if you truly have a good reason to keep a magazine collection, there are some lovely magazine files you could keep them in. One place with a large selection of patterns is The Empty Box Company. 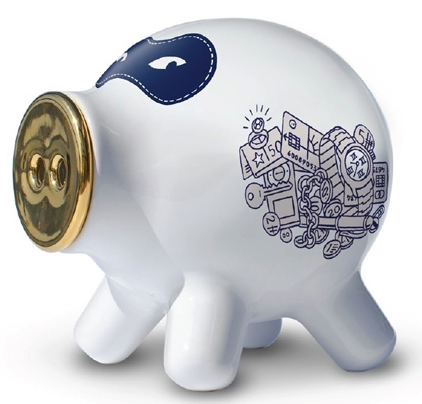 The Danish company Manostiles has some nice magazine files; you can buy them from Cahetu. [via decor8] Update on Aug. 21, 2012: I'm no longer finding these at Cahetu, but you can buy them directly from Manostiles now. 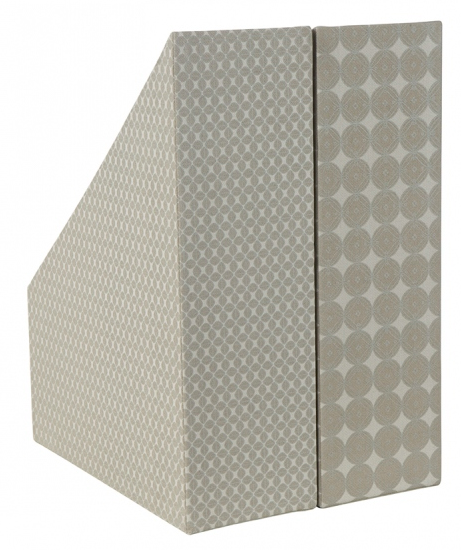 The Orla Kiely magazine holder is a fun option. 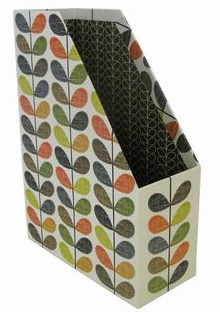 Update on Aug. 21, 2012: I'm no longer finding this magazine holder, but I'm finding another Orla Kiely one! 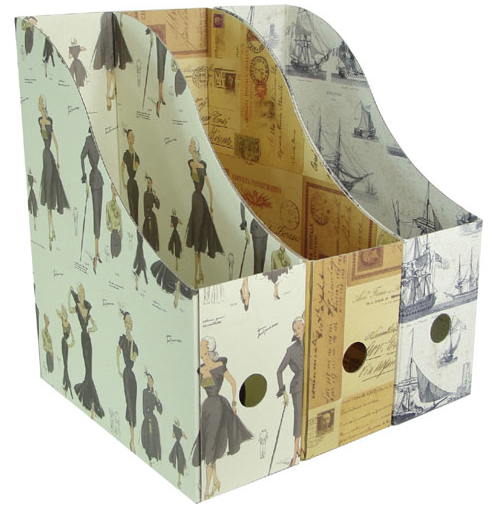 And here are the Rossi Italian paper magazine holders. Bashful Bunny has a number of choices in magazine files. 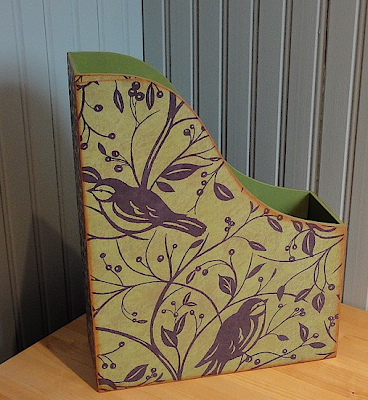 And Laughing Taffy Designs has interesting one-of-a-kind magazine holders. 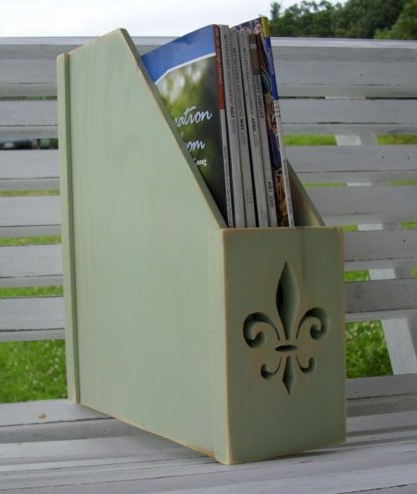 Here's the magazine storage box from Nila Poff Custom Crafts. Want something with a more corporate look? Take a look at Ultimate Office. 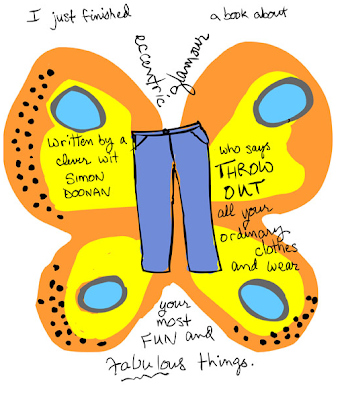 How many of us have closets full of clothes we don't really love? If you're one of those people, head over to Franke James' blog and read her complete illustrated post about how she originally laughed at Doonan's advice - and then decided he might indeed have a point. "My closet will be so spare and uncluttered," she writes. "I will wear only my favorite clothes." You'll want to see the far-from-ordinary clothes and accessories she speaks about keeping! And you'll be glad to know Franke wasn't considering actually throwing out the "ordinary clothes"; they would go to her sisters and their children, to Goodwill, or to her Freecycle community. Some people thrive with a personal uniform; Doonan has a different approach which might appeal to others. They are two different strategies for reaching the same goal: closets containing only the clothes which truly serve us, be they functional or fabulous. And on a personal note: You may have noticed I've not posted much the last two weeks. Sadly, this is because I was out of town visiting my dad; my stepmom just died last week. 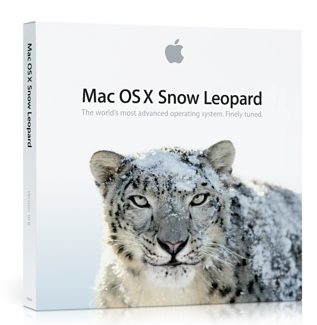 Snow Leopard - the latest upgrade to my MacBook's operating system - was released in August 2009. I finally installed it three weeks ago - just in time for the next release, Lion, coming out this summer. So I thought I'd share my story of procrastination, and how I got past it. What held me back, given that I've had no problems with upgrades in the past? All sorts of imagined stumbling blocks, which made the whole thing seem overwhelming. But when I broke the process down into small steps, each one was easy. 1. See which applications need upgrades to work with Snow Leopard. Answer: Only two! What a relief! I had upgraded Quickbooks some time ago, so now all I had left was Microsoft Office and Freeway Pro (the software I use to create and update my web site). This was easy; I could download the latest version from the Microsoft web site for a free 30-day trial. I did that, and it worked just fine, so then I bought the software and registered it. The last time I upgraded this software, it was a big deal - a bunch of preparatory work was needed - so I was sort of dreading this upgrade. I didn't see anything on the vendor's web site about the upgrade process, so I sent of an email asking about it. I got an answer right away: This upgrade didn't require me to do anything but install the software. So here I'd been imagining a problem where there wasn't any! I was all ready to buy the upgrade, but then I saw I qualified for a discount - so I sent off the information needed for that. I got my discount code very soon afterward, and then bought the upgrade and installed it, again over the internet. 4. Figure out how my new external DVD drive works. The DVD drive in my MacBook died outside of the extended warranty period - and the folks at the genius bar suggested just buying an external drive, which I did. But I hadn't yet used it, and now I needed to - and I hit a minor stumbling block. I had expected an icon to show up on my desktop when I attached the drive, but that didn't happen. I assumed I'd bought the wrong product, or I had bought a dud. But when I wrote to the company that makes the drive, they explained that's how it's supposed to work - it doesn't show up until I load a DVD. Sure enough - when I loaded a DVD, it showed up just fine. So there was no problem here except my misunderstanding of how things worked. More relief! 5. Do a full backup of my laptop. I do this regularly, anyway, so this was an easy step. 6. Do the operating system upgrade. As expected, this went without a hitch. 1) Just take one baby step after another; that's how projects get done. 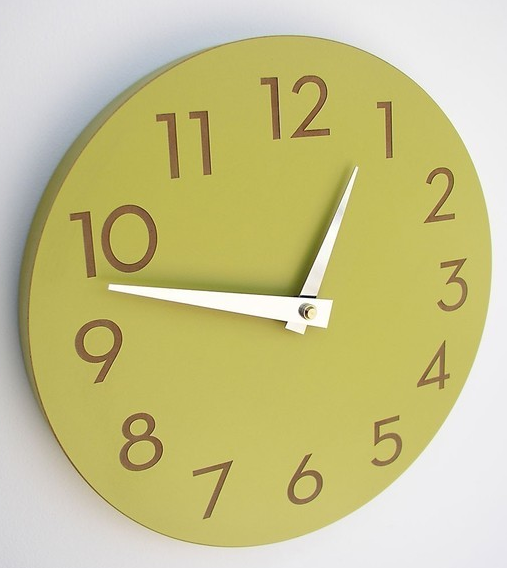 2) Projects are often less difficult and time-consuming than we imagine they will be. Don't let the imagined problems stop you from taking those first baby steps. 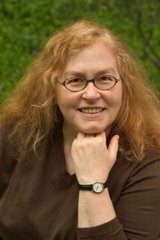 Perfectionism is one of those things that can get in the way of getting organized. For example, I see people trying to find the perfect new home for everything they are getting rid of - which is fine for 5 items, and not so fine for 500 or 5,000. Perfectionism is also a huge issue when it comes to time management. I began to say "Oh hell yes!" rather than "Sounds fun, but I have lots of work to do" or "I'll do that when I'm _______ (thinner, less busy, better prepared)." I don't think that some people are perfectionists and others are not. I think perfectionism exists along a continuum. We all have some perfectionistic tendencies. 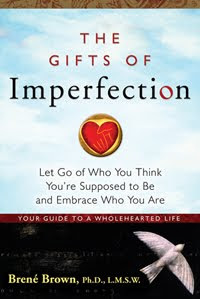 The book has more to say about perfectionism, and much more to say about what Brown calls "wholehearted living" - practicing courage, compassion and connection. Much of it has nothing directly to do with organizing. But if this sort of thing appeals to you, consider picking up this book. It spoke to me; maybe it will speak to you. 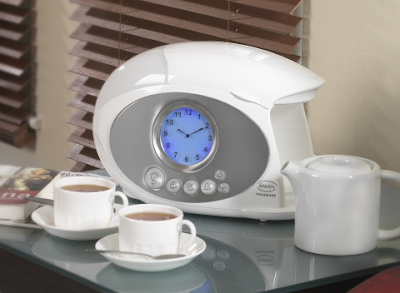 If we must have alarm clocks in our lives, they may as well be nice ones! 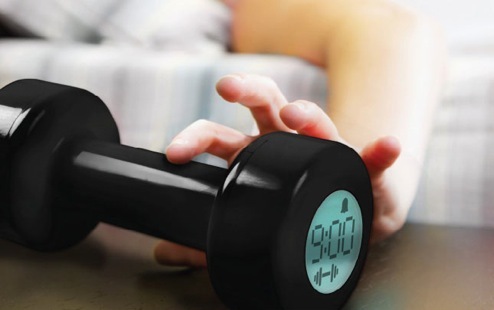 If you don't want to just use an alarm clock function on your smart phone, here are some other clocks to consider. 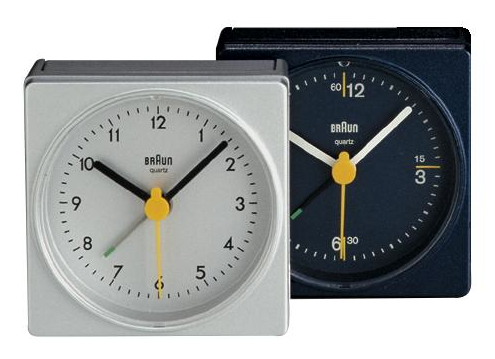 For other Braun alarm clocks - including a voice-activated one - you could head to the Unica Home web site. 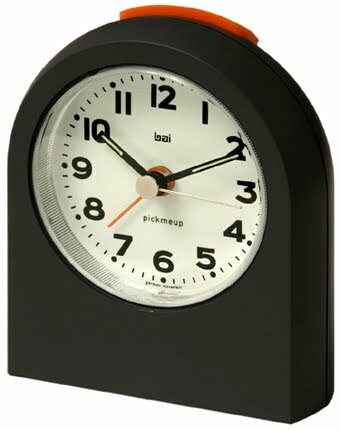 Thomas Bai also provides some nice, simple alarm clocks. This one is the pick-me-up, which Bai describes this way: This innovative alarm clock features innovative lift-light and lift-snooze technology that lights up the clock for visibility and turns off the alarm (snooze) when lifted or tilted. 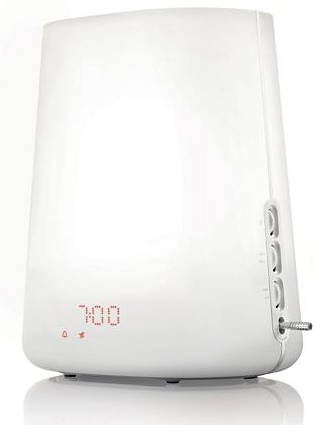 For a very different type of clock, take a look at the Philips Wake-up Lights. When I first read about these lights, they weren't readily available in the U.S. - but now they are! 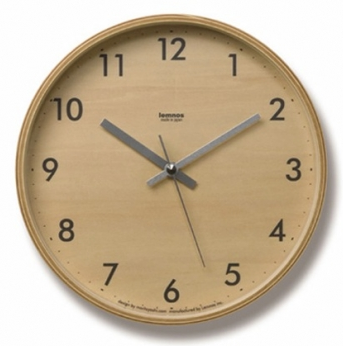 Analog clocks are beautiful. They don't just tell time, they show its passing. -- Shannon Taylor, commenting on an Apartment Therapy post entitled Wall Clocks: Ubiquitous Relics? 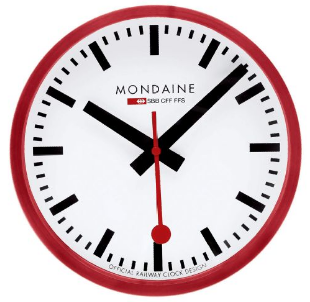 For those who still like to have clocks - rather than always relying on computers and such for checking the time - there are some lovely wall clocks to consider. 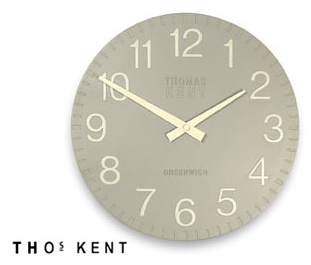 Thomas Kent clocks are made of hand painted cast plaster, and come in quite a range of colors. You can get them here and here - and many other places. 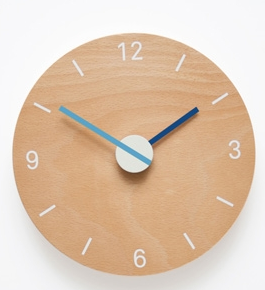 Finally, for something very different, here's a giant clock sticker that comes with battery-operated hands that you attach to the wall after applying the sticker. 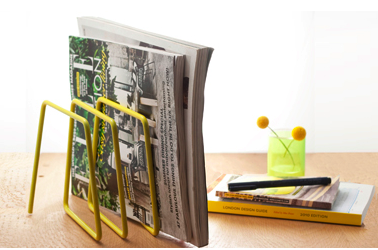 Want a colorful magazine rack? 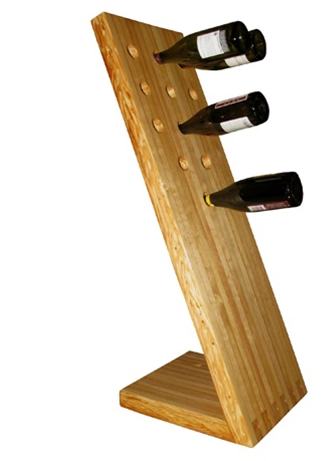 See yesterday's magazine rack post - or see the magazine rack pictured above, from Block Design - which I found after I published that post. "Block is all about Colour," the site says - and this magazine rack comes in five colors, only one of which is a neutral! You can also buy it from Bouf. Update on Nov. 30, 2012: I'm no longer finding this at Bouf, but I am finding it at Home Clever. But what if you'd like something that isn't so colorful? 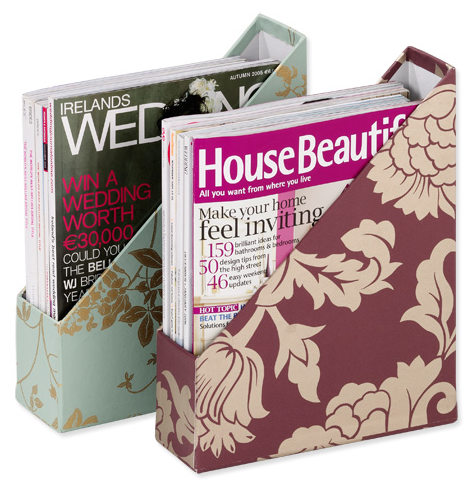 The colorful magazine racks I've listed come in more neutral colors as well - but I've got lots of other nice suggestions, too. 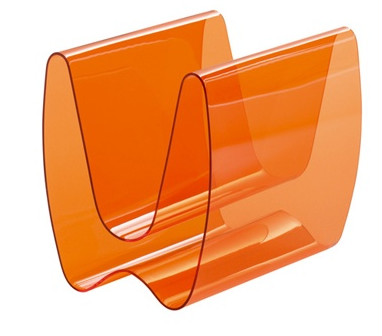 Let's start with the Wirehouse magazine rack, designed by Ramón Middelkoop and Chris Koen and distributed by Invotis Orange. 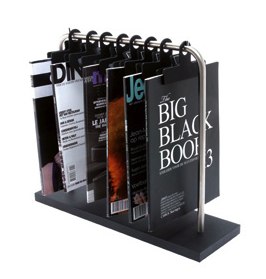 For a different kind of look, there's the Float magazine rack from J-Me, available in chrome or black, with a 12-magazine capacity. It's widely available on the internet. Another rack that follow the same general principle - hanging the magazines over rods or slats - is the Invisible Magazine Rack from Crate & Barrel; it's "invisible" when it holds its maximum capacity of eight magazines. 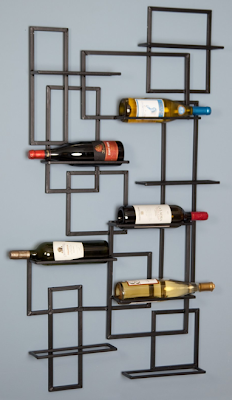 [via Apartment Therapy] Update on Nov. 30, 2012: Crate & Barrel no longer carries this product. 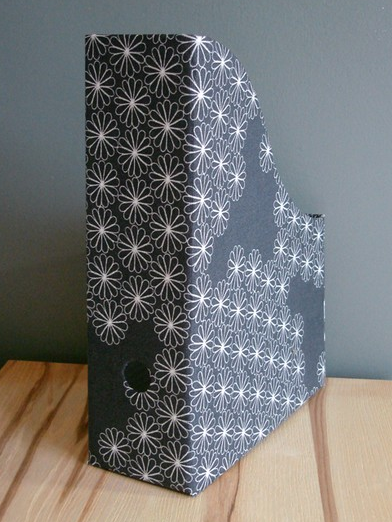 And then there's the TableMag, made in Belgium and available at Rose, in Brussels. 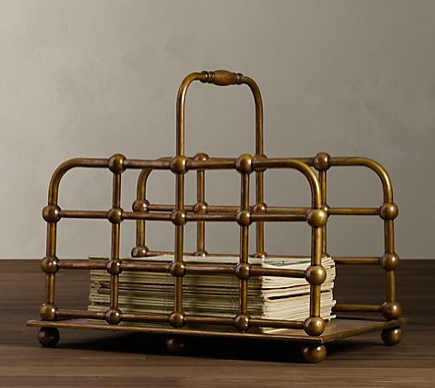 Restoration Hardware has a nice-looking magazine rack, "handcrafted of brass, iron and aluminum" - and "roomy enough for stacks of reading material." That could be good - but for some people, racks that limit you to 8 or 12 magazines might be better! 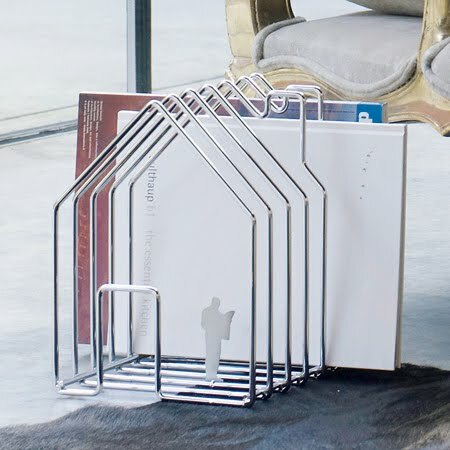 [via The New York Times] Update on Nov. 30, 2012: Restoration Hardware no longer sells this magazine rack. Bago Luma has this Chairside magazine rack, available from Carolina Rustica and Comfort House. When I first looked at this I thought it was made of cane - but it's actually made of hand-forged iron! 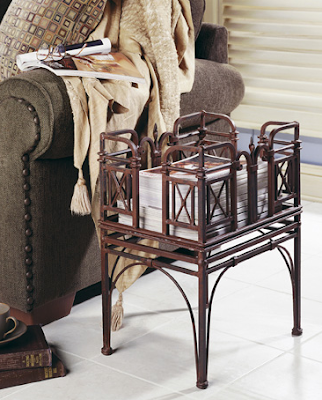 Update on Nov. 30, 2012: Bago Luma has gone out of business, so this magazine rack is no longer available. 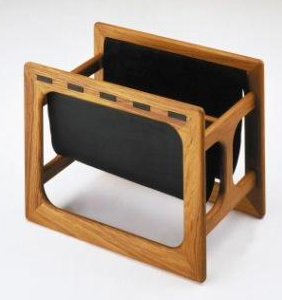 Here's a simple elegant magazine rack, made of teak and leather. Update on March 20, 2016: I'm no longer finding this rack anywhere. 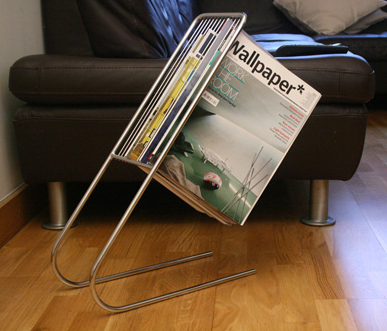 And for yet another approach, here's the 8-clip magazine rack from Present Time, located in The Netherlands. In the U.S., you can buy it through Digs. Sure! Things keep changing - products get discontinued and new ones are offered. (And sometimes old products are still around, but are carried by different websites and stores than in the past.) So besides updating the links on all my old magazine rack posts, I've found some new ones - including some that are definitely colorful! 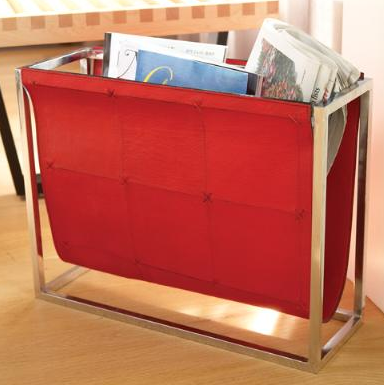 Let's start out with the Front Page Magazine Rack by Kartell. It's available in red and yellow as well as the more demure black, smoke, etc. In the U.S., one place to buy it is Hive. 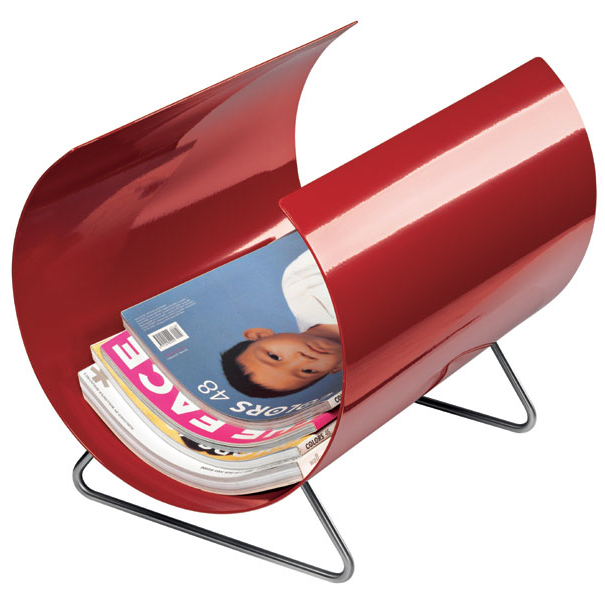 Casamania has a magazine rack available in red and orange (as well as black and other neutral colors). 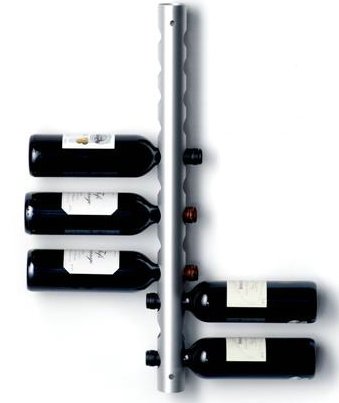 Michael Sodeau designed the Sprung Magazine Rack. 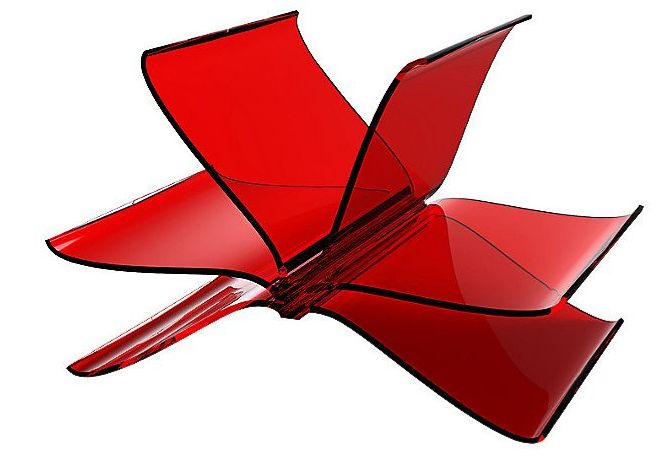 I'm not seeing this on the manufacturer's web site, though - and there are very few online purchase options. (Here's one.) So act soon if you want this one. 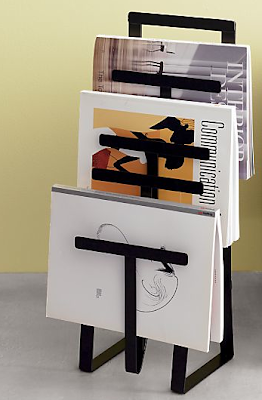 And here's the Buuk magazine rack, designed by Lorbus for Sintesi. 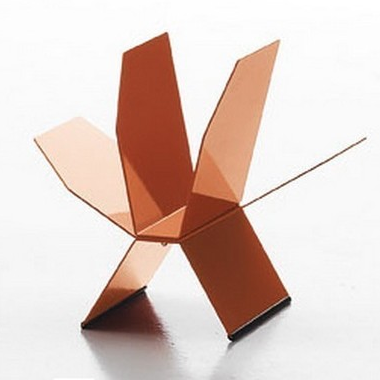 The photo comes from Bauhaus 2 Your House - which unfortunately is not selling this orange version right now. Other places selling this magazine rack - places which do have colorful versions - include Designyu in Germany, postmoderndesigns.co.uk, and Aria in Hong Kong. Update on Nov. 30, 2012: Designyu is no longer carrying this product. 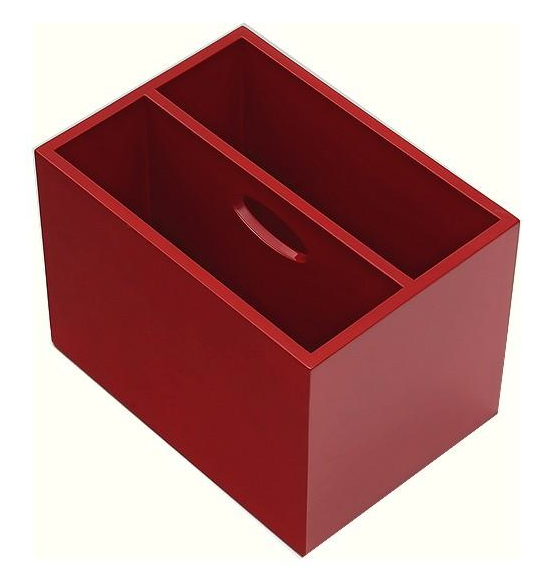 If you want a more classic look, there's this red leather magazine rack from Global Views. Finally, here's the Lipsi lacquered magazine rack from Busso - which has an online shop for the U.S.
"If you don’t see wine as art, fine. Go ahead and clear a shelf in the pantry. Right over there, next to the oatmeal and the Worcestershire sauce." 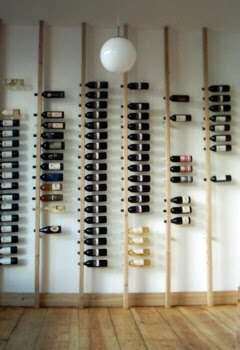 There are lots of alternatives for storing and displaying wine bottles; let's look at a few of them. Disclaimer: It's always best to control the light, temperature and humidity when storing wine. So if you're going to use any of these products, please be careful about where you put them. 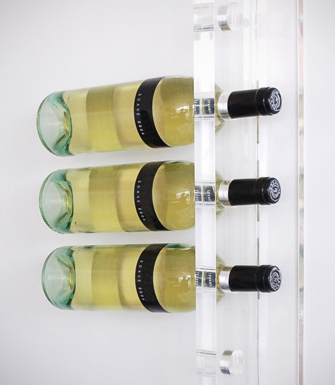 The Gus Modern acrylic wine holder - available here (and many other places - uses the same orientation of the wine bottles. Another product with a similar approach - but this time made from "anodised aluminium" - is the Rosendahl winetube. 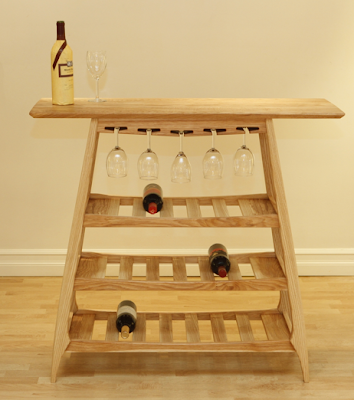 Here's a very different type of wine table: the Le Vendange Wine Serving and Storage Table by Numana Woodcraft. I found this table - and the next one - through CustomMade, a wonderful web site. 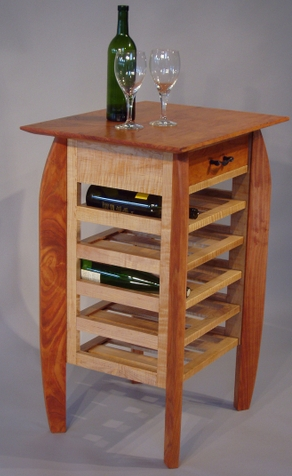 Finally, let's admire this lovely wine rack and serving table from Michael Hauck Designs. If you're going to accumulate a bunch of coins, why not do it in style? 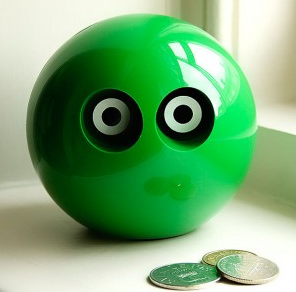 My latest find is this wonderful money box sold by Hus & Hem; it comes in yellow, green and red. [via Retro to Go] Update on July 9, 2012: These are no longer being sold by Hus & Hem, and I haven't found them elsewhere. 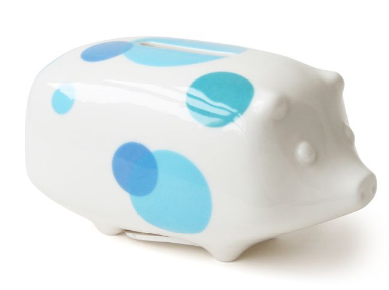 If you'd prefer a pig, you could get this piggy bank from Jonathan Adler, available in pink and blue. Update on Oct. 17, 2014: I'm no longer finding this bank. 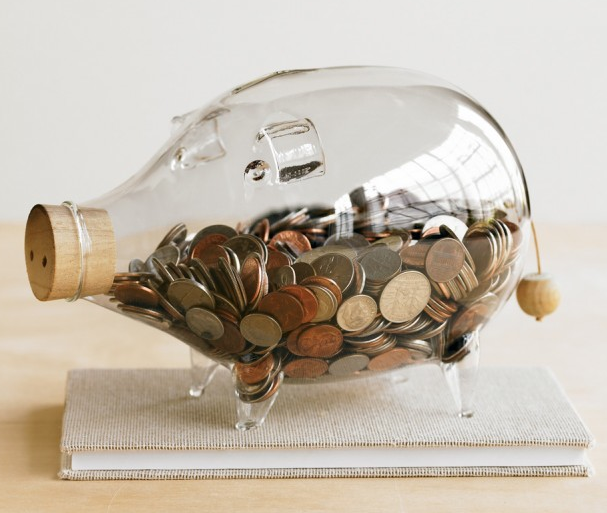 If you like to see your coins accumulate, you might like the glass piggy bank from Roost, available from Velocity Art and Design - and the one at VivaTerra, shown above, seems to be the same product. Update on July 8, 2012: I'm no longer finding this bank at either of those stores, but you get either this large bank or a smaller one from Fawbush & Schulz. 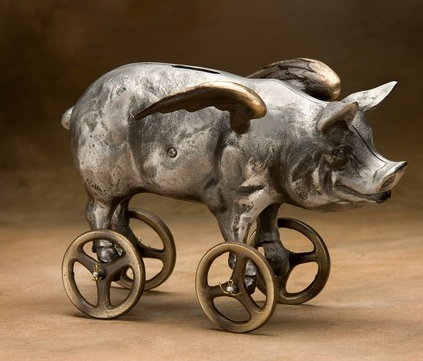 I was amazed to find this piggy bank from Nelles: "sand-cast bronze and aluminum coin bank, in the form of a flying pig with wheels." Take a look at Scott's Titanic bank and King Kong bank, too. 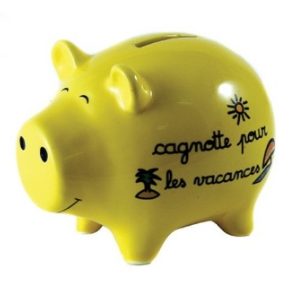 Richard Barley shared a picture of this cochon tirelire some time ago, and I finally decided to go find it on the web - because a piggy bank focused on saving for vacation sounds good to me!